IPS was designed to include six areas of importance: national planning doctrine, a system for identifying courses of action, a standard method for incorporating lessons learned, a process for linking tribal, local, state, and regional plans with Federal planning, a process for fostering vertical and horizontal integration of planning with all levels of government, and finally, a guide for for all-hazards planning. Incredibly, IPS accomplished its mission! NIMS references IPS, explaining that “while it is recognized that jurisdictions and organizations will develop multiple types of plans, such as response, mitigation, and recovery plans, it is essential that these plans be coordinated and complement one another. 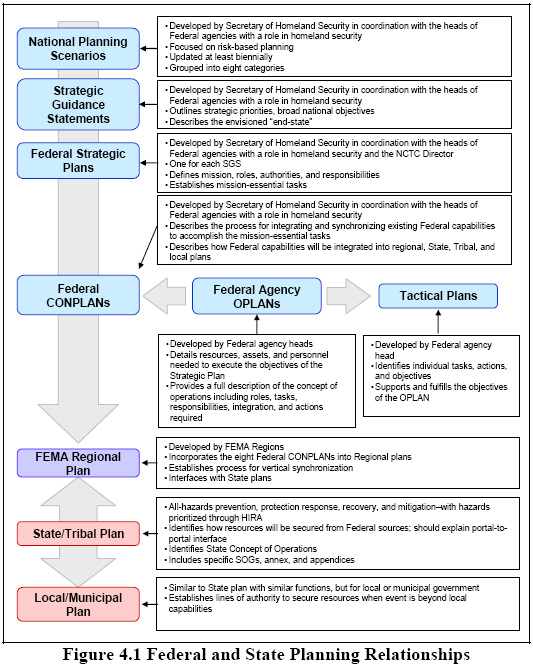 State, tribal, and local governments are encouraged to comply with the Integrated Planning System…” The only problem: IPS is so technical that few can stomach it. IPS never really caught on. Few people have implemented it. After Hurricane Ike in 2008, I was a contractor for FEMA using a draft version of IPS to perform strategic recovery planning at the JFO in Austin, TX. As a planning geek, I really like IPS. I liked it so much, that after our team wrapped up in Austin, I continued work at FEMA HQ in DC to develop a strategic recovery planning toolkit based on operationalizing IPS. I discovered that IPS held a powerful framework and process for planning that provided insight to some the problems I’d experience with planning. As any planner will tell you, in large organizations, one plan seems to beget another plan, which begets yet another plan. Developing a hierarchy of plans is important for vertical integration–especially for large agencies or organizations with complex missions. But without IPS, there was no standardization in the Federal government emergency management plans. But at less than 100 pages, IPS was a very brief adaptation of military planning doctrine, mainly the Joint Operational Planning and Execution System (JOPES). JOPES is the framework by which the US armed services plan operations together. For example, let’s say a mission in Adversariland was needed that required the Air Force to provide air cover, the Navy to soften beach defenses, Marines to create a beachhead, and soldiers to capture and hold a certain area. That “operation” is considered “joint” because it includes several different branches of the military. In my opinion, if JOPES is able to get marines, soliders, sailors, airmen, and coasties to all talk to one another and plan operations (even if it is only implemented at the highest ranks), it seems like it must have lessons that civilians could learn as well. In order to better understand IPS, I researched JOPES by reading publicly accessible JOPES training documents and manuals, such as the user guide for JOPES and the precursor to Joint Publication 5-0. 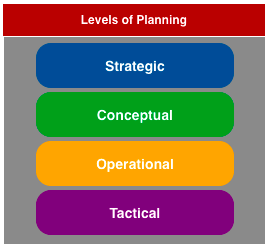 JOPES can help civilian planners understand the various levels of planning (see above for the colorful table I made) and how plans that jumble all the levels together are poorly written and disjointed. A plan that drops from strategic level to tactical level is like an elevator without brakes. Vertical integration among complex, disparate organizations takes a strong foundation (found in IPS). At the end of March 2011, Presidential Policy Directive-8 (National Preparedness) was signed, rescinding HSPD-8 (the foundation of IPS). Although PPD-8 calls for the development of the National Preparedness Goal (released in Sept 2011) and the National Preparedness System (description released in Nov 2011), the foundational elements of IPS are lost. In its place are core capabilities, which are generic program elements, such as Planning, Public Warning and Coordination, and Operational Coordination. While I understand the change and I can appreciate the gained ease-of-use of some parts of the National Preparedness System (by the way, now we’re going to be getting National Planning Scenarios and the National Preparedness System confused…), I feel a tinge of loss for IPS. IPS is sound planning doctrine and provides an introduction to planning that the next generation of planners and emergency managers ought to have the benefit of learning. Let’s hope the National Planning System can catch the attention of more planners and become the accepted standard that IPS wasn’t. If “whole community” is to be a reality, it will take a strong, integrated planning system. Looks like it is based on Integrated Marketing Management concept, which as been around for years. Glad to see some of the proven private sector management tools making their way into the public sector.